The well loved Dodgers skipper Wilbert "Uncle Robbie" Robinson looks as happy as can be. 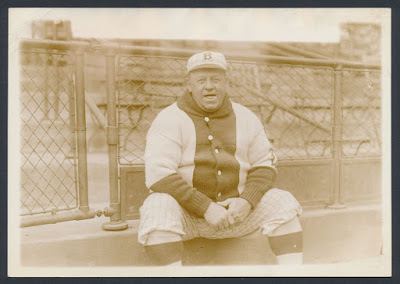 He is sporting Dodger pinstripes and a fantastic Brooklyn sweater to go along with his robust waist. It is dated to the tail end of the 1916 season; a year the club won it's first National League pennant in sixteen years. It is currently available at RMY Auctions. BTW, the photo was found in the archives of Underwood and Underwood - a well regarded sports press photo shop at the time. Via Jesse Sanchez at MLB.com, "Urias may decide between Mexico and Dodgers." "My first choice would be to be here with the Dodgers and see if there is an opportunity for me here," Urias said in Spanish. "I prefer to be with the Dodgers. But at the same time, I would enjoy being with the Mexican team." Via Cary Osborne at Dodger Insider, "Eager to go from Seager to Seager." Cary speaks with Chris Woodward, the Dodgers' new third base coach, about Corey - after having spent so much time with his brother Kyle in Seattle. Via Ron Cervenka at Think Blue LA, "There’s focused – and then there’s Jack Murphy focused." Ron chats with the newest Dodger catcher. Alex Wood was playing hurt last season, via Andy McCullough at the LA Times. He apparently rolled his ankle in his final start as a Brave - just before coming to Los Angeles. Via Jesse Sanchez at MLB.com, "Maeda, Ellis find rhythm in bullpen session." "I know about his fastball command and I've seen evidence of his slider and how devastating his slider can be, but I was impressed with his changeup and his ability to throw that today with the quality of depth he had with it and really command it in the middle of the plate," Ellis said. "We talked for a while afterwards about what an important weapon that can be for him this year." He's back. Via Ken Gurnick at MLB.com, "Dodgers ink veteran reliever Wright, bring him into camp." In hobby news, John Mackie at the Vancouver Sun writes about a vintage find of Vancouver BC Baseball memorabilia; "Baseball treasures found in Metro Vancouver attic" (link here).